(CNN) -- Investigators are pursuing several new leads in the case of a missing 5-year-old girl in Florida, they said Tuesday. Haleigh Ann-Marie Cummings, 5, who vanished a week ago, may have been abducted, police say. The Putnam County Sheriff's Office on Monday night searched the neighborhood of Haleigh Ann-Marie Cummings, who vanished a week ago. Deputies also searched surrounding neighborhoods. 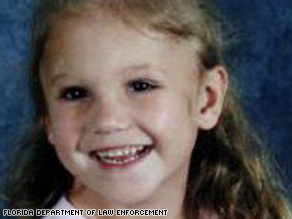 Authorities said the girl may have been abducted. Officials wouldn't release any details on the leads. "Those leads, like I said, are as a result of doing the neighborhood canvass last night, and we will be following up on those leads today," said Capt. Steve Rose of the Putnam Sheriff's Office. Since opening the case a week ago, authorities have received more than 1,200 tips about the missing girl, 500 of them since Monday, Putnam County Sheriff Rick Ryan said. Tuesday afternoon, the sheriff's office announced they have changed the Amber Alert they originally put out for the little girl, saying they changed the description of the clothing. "What we need people to focus on is the face, because we do not know at this time what the clothing was at this point," said Dominick Pape with the Florida Department of Law Enforcement. Rose said investigators also conducted a checkpoint in the area last night. Cummings shares his double-wide mobile home with Croslin, daughter Haleigh and a 4-year-old son in Satsuma, east of Gainesville. He has said that when he returned home at 3 a.m. ET, he was surprised to see Croslin awake and asked her why she was up. Croslin waited until Cummings came home to phone 911 about the girl's disappearance, though it's unclear how long that wait was, authorities said. Police said last week that Croslin had tucked the girl and her brother into bed at 8 p.m. before going to sleep at 10. The girl, boy and Croslin usually sleep in the same bed. Officials said they originally thought Haleigh may have wandered outside on her own but are now certain that she was abducted. Investigators are looking into various angles of the case, including finding out the location of 44 registered sexual offenders who live within a 5-mile radius of the Cummings home, said Lt. Johnny Greenwood of the Putnam Sheriff's Office. A nationwide Amber Alert said the girl was last seen wearing a pink shirt and underwear.